Last night, I went downstairs to put some things into storage and discovered that a pipe was leaking water right onto a bunch of boxes full of some old scrapbooks and childhood keepsakes of mine. I started rummaging through the boxes, looking for damage, as I moved them to a safer location. It was so fun looking at old, obscure photos from years gone by. I also found a little photo book that I had filled with pictures that made me smile. In my 20's, as I moved around a lot chasing my dreams, I kept this special photo book with me to remind me of the dear people, places, and events who had loved, supported, befriended, and mentored me along the way...People who, in my quest, I had to leave behind, but they always remained close to my heart. Do you have a little book like this? For a moment, it made me sad to think that I might have lost these precious photos to a silly leaky pipe! So I've decided to share a few pictures and stories with you from "my favorite things" photo book. That way, I'll share a bit of myself with you, and my stories/pictures will be "safe" from water damage. 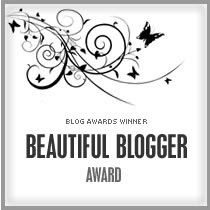 I also am doing this, because a few weeks ago, I received a "Beautiful Blogger Award" from Tami at A Battle Worth Winning. As part of the award, I'm supposed to tell you seven things that no one really knows about me, so this peek into my life will probably fit that bill. 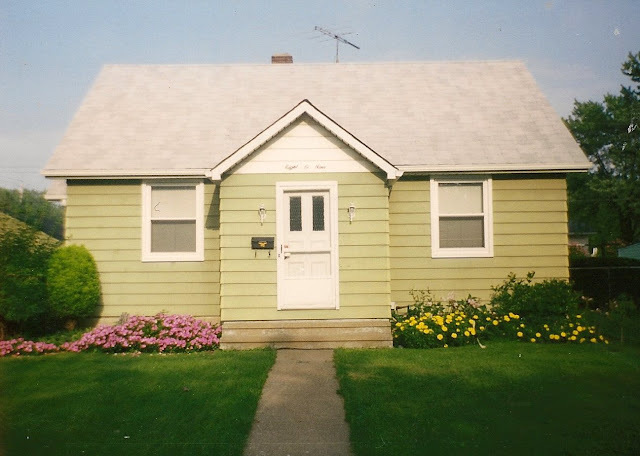 This is the house where I grew up: 809 Warwick Drive, Sheffield Lake, Ohio. Someone else lives here now, but to me This will always be Home. My bedroom was in the attic. I shared it with my sister Marissa. Our room took up the whole second floor, had slanted ceilings and cool little doors and built-in desks in the walls, and an awesome book shelf that went all the way around the staircase and was always a mess. This is the first page of my special photo book. 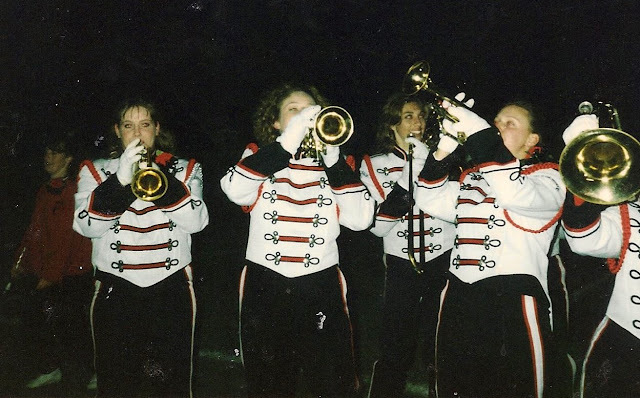 This is a picture of my friends and I during our final Marching Band performance, Senior year of high school. I'm the second one on the left. I wanted to quit Marching Band my freshman year, but boy am I glad that I didn't. I found some of my best friends in this group. I learned discipline and hard work and the thrill of performing. Occasionally, I have very upsetting nightmares in which I quit band and miss out on Senior year. I still love playing the trumpet. It makes me feel alive. This is a ticket to the Martina McBride concert that my husband took me to as a Christmas present, right after I had Guy. This was the second time I'd seen her live in concert. I cried seven times. She has an amazing voice. I guess I have a lot of deep emotions associated with her music. This is my friend Michelle. She took care of me when I was an intern in D.C. Since I didn't have a car, she always drove over to my apartment in Randolph Towers and drove me to church, institute, and singles activities. She made me feel very loved. 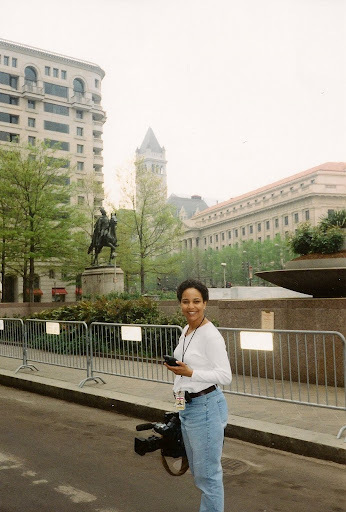 When I moved back to DC a few years later, I was so happy to find she was still around. 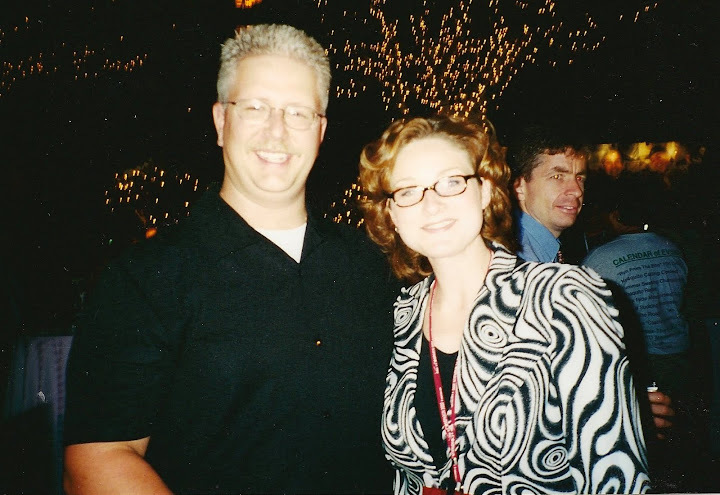 Here was are at a Christmas party at our Bishop's house in 2002. This picture will always make me smile. 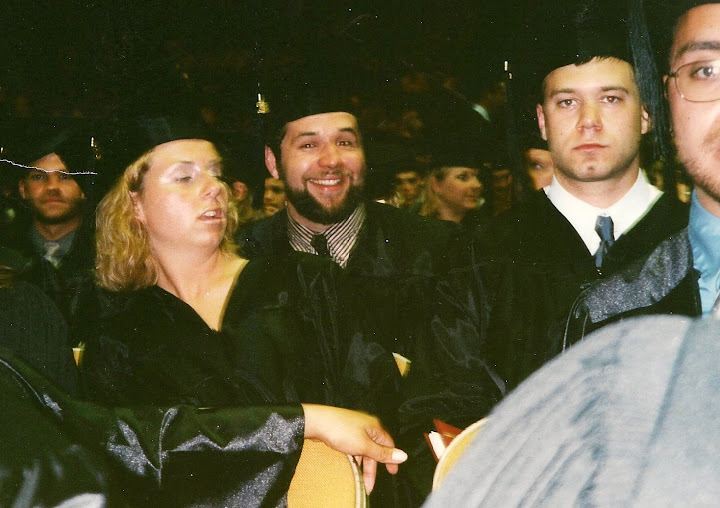 This is a picture that I took of my friend Cory during our college Graduation ceremony. I turned around to see if there were any friends nearby, and I was surprised to see my friend Cory, who I worked with at The Office of Student Financial Aid, just three rows back. So I took his picture. We actually continued our friendship after college, and he really helped me get through a time of adjusting to life in "the real world". Cory's laugh is the most infectious I've ever heard. When I look at this picture, I can hear him laughing. This is my friend Beth. We were roommates Freshman year of college. She is a very happy, joyful, sweet, and innocent person. She also loves Disney songs and music in general. 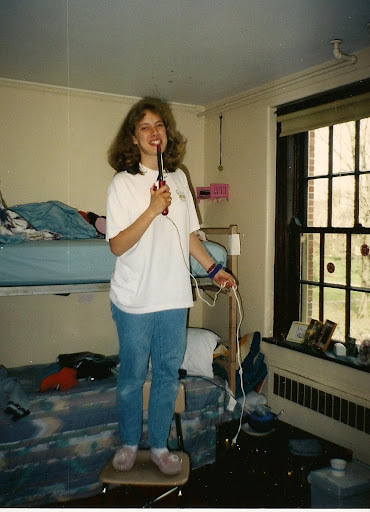 Here she is singing probably something from "Beauty and The Beast", using her curling iron as a microphone. I remember that we were always laughing together. I could not have asked for a better roommate. This is my photog friend J.T. and me in L.A. during the Democratic National Convention of 2000. I met J.T. when I was an intern at Tribune Broadcasting in Washington, D.C., so it was fun running into him again in LA. JT and I had lots of long talks while we were out on assignment working together. He also taught me how to cook, sort of, since it was my first time not being on my college meal plan! This is the day that I left Columbus. I hated living there. It was funky in all the wrong ways. But I did love these friends of mine. We worked at MediaSource together. In this picture they are pumping me up for my move to DC, making sure that I had everything that I needed, including confidence to go after my dreams. 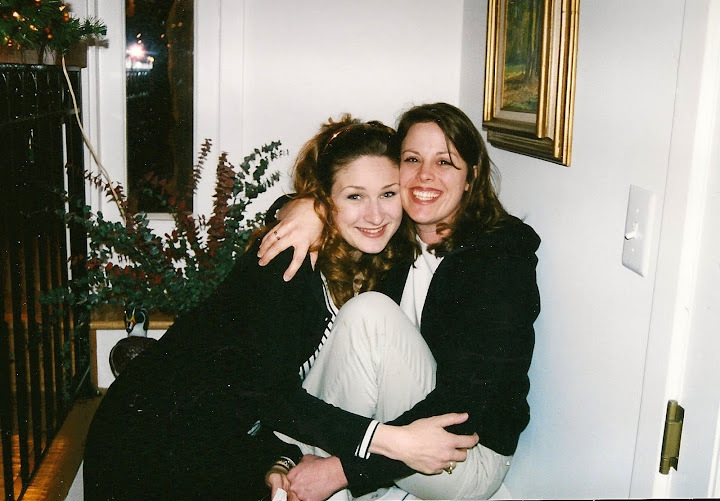 Kristin, who had already done her time in NYC, was always giving me straight-talk...advice to help me grow-up a little bit, so I'd be ready for the big time. I am thankful to her for that. 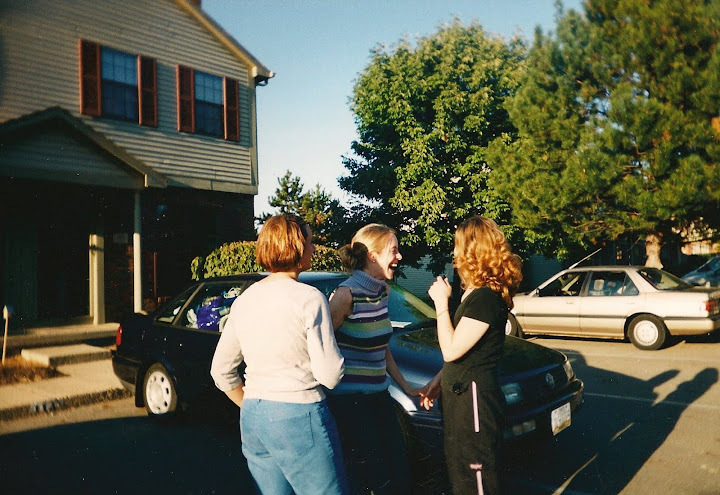 I love how Andrea is holding my hand and sharing one last laugh with me, before I embarked on my big adventure. She wouldn't let me leave without my fuzzy bathroom rug, because I told her that I couldn't get up in the morning without it. She rearranged my over-stuffed car to make it fit. Now that's a good friend! Say hello to Irene, another photog friend from my days at Tribune Broadcasting. Irene was so much fun to work with, and she really took me under her wing. In addition to helping me with my resume tape, she was just a really good friend. Irene was always leading me into situations where I could grow professionally. One morning, Irene realized that the bureau chief was going to forget to come to the control room to produce a life shot (pardon the jargon!). So, instead of reminding the big boss to do her job, Irene put me in the producer's chair, placed the headset on my ears and talked me through producing a live shot. I was talking in the reporter's ear, cuing the photographer, and keeping the local station on cue. When the bureau chief came into the control room and found me, her intern, producing live television, she was pretty impressed. Thanks, Irene! 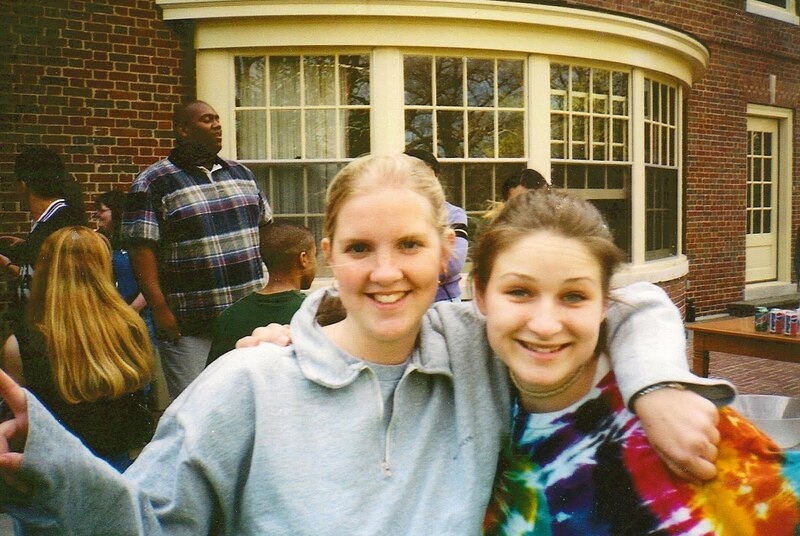 And lastly, here is a picture of my friend Emily and me on our last day freshmen year at Miami. We are standing on the porch of our freshman dorm Reid Hall. This hall has been torn down and replaced with married housing, but I have so many good memories of this dorm, and I made some of my best friends here. I remember being a bit homesick while reading a letter from my boyfriend. I was sitting on this porch at night sobbing. I thought I was alone, but someone yelled out their window "hey, are you ok??" Uh, embarrassing! I got through it all...all four years and beyond, with a little help from these friends. The big guy in the background is Shakka...our R.A...He was a blast. We lovingly called him "Papa Shakka". At Christmastime, they orchestrated a party. The RAs asked our parents to send us a Christmas gift. Shakka dressed up as Santa and passed the presents out to each of us. We called him Shakka Santa after that. It was quite a sight and a memorable night. Thanks for coming with me down memory lane. And thank you to Tami for this blog award. Tricia over at Tricia's Take...She's also having an awesome GIVEAWAY right now...but I was going to give her this award before I knew about the giveaway! Tricia showcases her modest fashion choices daily. My Mom Susan Hatch who always shoots it straight. Today she is blogging about Service. Check it out. Jenn, because I think she is a very interesting person and I'm glad she's local (not loco). Jenna, because now I feel guilty for not replying yet to her very important question...but I am thinking about it....thinking oh so deep thoughts about it! Also, because she's cool. Marie at Marie's Make and Mend, because she made 40 journals for The Write It Out Project, Service Boot Camp. And she's probably going to make more. Millie of Inspirational Letters from Millie who is always serving others. Lara of The Golden Seven who celebrated her 37th Birthday by doing 37 random acts of kindness/service for others. I sooo want to do this for my birthday this year! oh my! 809 with script above the door...that is an old photo. and sadly, i think that will always be my home. wish we hadn't moved. where would I have spent all those Fri/Sat nights if it weren't for watching the marching band. I still swear that band could have played and beat any other football team better than our FB did. The band? excellent! the FB? pathetic. Those glasses? fake or not...you need more pairs for fun. And what's wrong with that outfit. It is pure California. PA needs a bit more California. One day when you can let go of the hurt,you'll discover Cbus taught you many things and allowed you to grow. It WAS your first place of independence and that's to be cherished. MU tore down Reid Hall? Did I know this? darn! And who could forget Shakka. didn't you get his help when that naked drunk guy decided to crawl into your bed (by mistake)? You oughta blog that! Here's a toast to all your good friends, then and now! And thanx for giving me that blogging award. Mine is nowhere like the rest your have awarded (nor as elequent) but it is kind of you. I did not know you are from Ohio. I grew up in Ohio, moved away, got married etc and am now back. I love it here. Would be happy to stay here but we will see what my husband's career has to say about it. Thanks sweety...I was so surprised to be part of this elegible cast of fine bloggers...thanks, I will post it on my blog....those pics are the best. When I was in school too many years ago in N.Y....all the kids in N.Y. always bought those zippered autograph albums, I'm sure someone out there remembers those albums...well I had 5 of them full of everyone's signature with a thoughtful note. Unfortunately I have no idea what happened to them once I moved to Puerto Rico...I did learned from that experience, so since my boys were born I have been collecting loving letters, cards, photos, & some precious gifts from them and from everyone that mean so much to me. I keep it all in my very own tresure box in a plastic storage tub to prevent any moisture or water from damaging them. I even have my ex-husband's love letters dating back 40 years. Every time I read those letters tears flow and many memories flash through my eyes of those wonderful days together. Keep cherishing every moment you can because someday those special memories will drench you with love and happiness when you need it the most. Love you. It's been a LONG couple of days. Thanks for making it a little brighter! Love all the old photos! Enjoyed learning more about you. Not surprised your first photo is of your home when you got your roots and courage to find wings. Be sure and organize this info into a little bio. for your family. I made one for my grandkids called How I got my testimony. Probably the most important thing I want to preserve for them. thank you Jocelyn for my blog award. You truly are an inspiration to so many and i value your friendship. I loved seeing your pictures and seeing some of your memories. i so wish I had written better journals and I have hardly any pictures of growing up houses etc. That might be why I have so many pictures of places and my kids to make up for it. What a great post!! Taking us through a bit of your life and memories.. !! have a great day! you've done amazing things, girl! !